Maybe the regions of Nepal are not that known when it comes to angling and sportfishing, but if you get a chance do bring your fishing rod with your travel gear to Nepal. 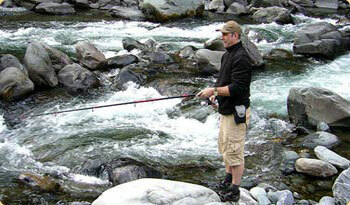 Some of the popular fishing trips in Nepal are done in Karnali, Babai valley in the Bardiya National Park. Chitwan also hosts a number of places like the confluence of Seti and Trisuli rivers on the Tribhuvan Highway and also in the confluence of Kaligandaki and Trisuli river. Anglers can try their luck in the clear waters of Pokhara’s lakes as well. While Phewa Tal offers some good sport, there is considerable activity and is not the ideal place for a quiet day’s fishing. Begnas Tal and Rupa Tal are a better bet. Get out there on any of several local buses that start plying early morning or bike your way there. You can hire a boat and go out to some of the good spots in the lake.